As a little girl, I can't quite remember having a favorite color. My mom always dressed me in bright, vibrant hues of orange, purple, blue, green, and red--most of the time all at once. She expressed her love of color through all of her children, from the patterns of our jumpers and wind-breaker sets, down to the soles of our L.A. Gear shoes. And this love of color was apparent in her wardrobe as well--with her button earrings, cute and comfy separates, and color-coordinating ballet flats for each outfit. With this undeniable love of color, it was rare that my mom dressed my sister and I in pink. So I find it funny how I would still end up choosing fuchsia, a variation of pink, as my favorite color later in life. 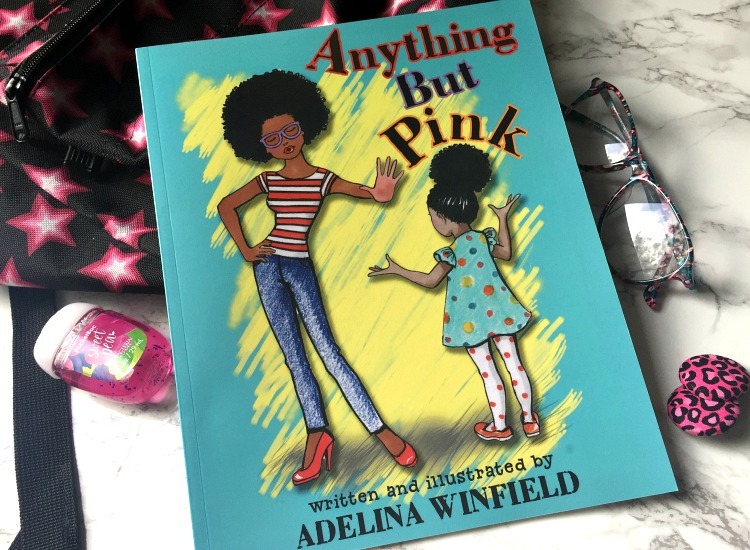 Reading Anything But Pink by Adelina Winfield makes me wonder if there was reasoning behind the lack of pink in my childhood wardrobe. 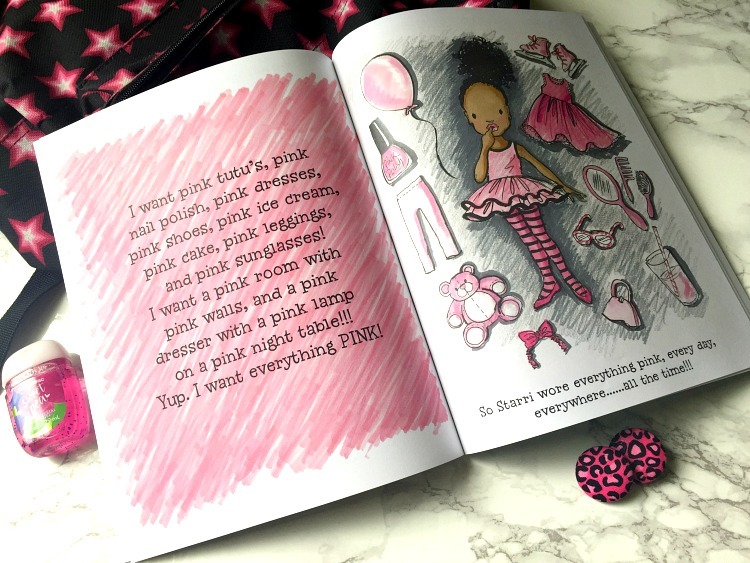 In Anything But Pink, a book written by the author about her own granddaughter, an expecting couple vow that their daughter would be different from other little girls. Gazing up at the sky one night, they decide to name her Starri after the star-filled sky. Along with giving her a special name, they also decide that they would dress her in anything but pink. Besides, that's what every other little girl would be wearing. And these parents wanted their daughter to be set apart from the rest. To honor this vow, Starri's parents had a baby shower and they had only one rule for their guests: DO NOT BRING ANYTHING PINK. So Starri's family would celebrate her coming into the world with every color but pink, decorate her world with every color but pink, and even eat delectable goodies in every hue under the sun except... you guessed it, pink. And when Starri was born, she wore every color you could think of in all of her wardrobe options. She was laced in lavender, green, and even peach. The forbidden color would continue to be ignored until one day when Starri asks her parents if she can wear a PINK dress. This would be the day that changes everything. A simple shift in Starri's wardrobe choices would open the door for lessons on change and flexibility for both Starri and her parents. Reading this book was a joy for both me and my children. While this book is ideal for children ages 3-7, my 12-year-old daughter enjoyed reading this book to my 3 year old son, especially at bedtime. While Starri reminds me so much of my daughter as a small child (complete with the sass and gravity-defying afro-puff), I believe my toddler son learned the most from this book. "But pink is for girls," he told my daughter the first time she read it to him. "I wear all colors, blue, green, black, and mostly red, but I'm a girl. Aren't I a girl?" she asked him, laughing. "I guess so," he replied, nodding his head and urging her to continue the story. 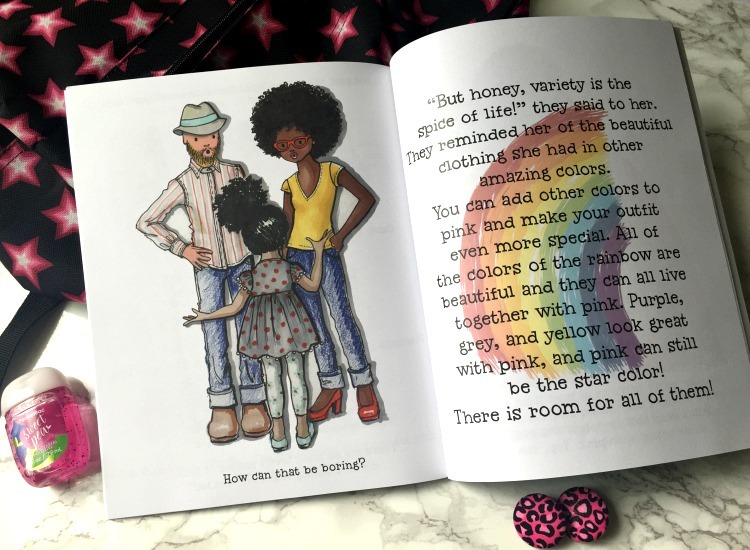 By the end of the book my baby boy was beginning to understand that the color of clothing we wore didn't matter as much as he originally thought. Even I learned a thing or two when reading Anything But Pink. Sometimes we want things so badly for our children. And oftentimes, by their own will, they wind up wanting just the opposite. As parents, we want our children to stand out and embrace who they are, but sometimes we end up boxing them in. As much as I wanted my daughter to wear her pretty bows and barrettes up until she was in middle school, she wanted to rock those afro-puffs every day. Who would have thought that this would be how she would learn to embrace her natural hair, despite the other children around her wearing their hair very differently than she did? Anything But Pink taught me to be more flexible with my children. I could continue to introduce them to new things, different styles of clothing, different games, and even different foods. But it was up to them to decide what their likes and dislikes are. This is one simple way we could all learn to be more open-minded and adapt to change. 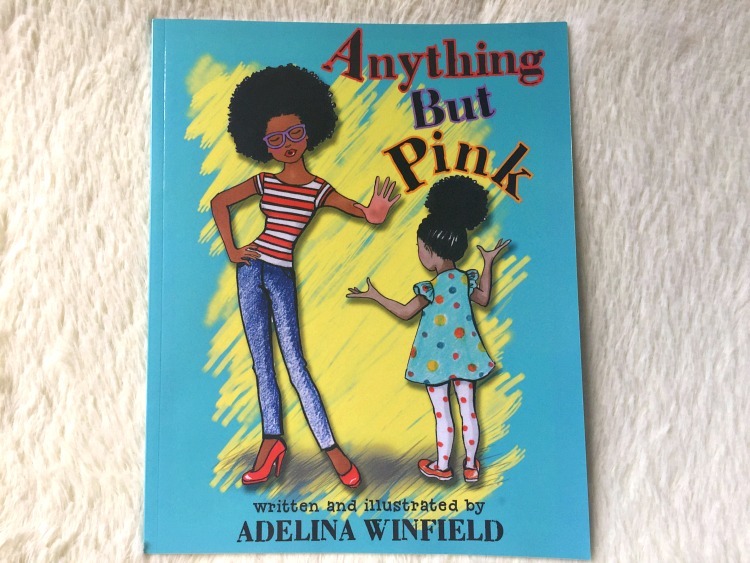 I urge all parents and anyone with little ones in their lives to check out Anything But Pink by Adelina Winfield. It's a beautifully illustrated book that the children will want to grab for all the time! To get a copy for yourself, your family, your friends, and/or the children in your life, be sure to click the link here. Have you read Anything But Pink?